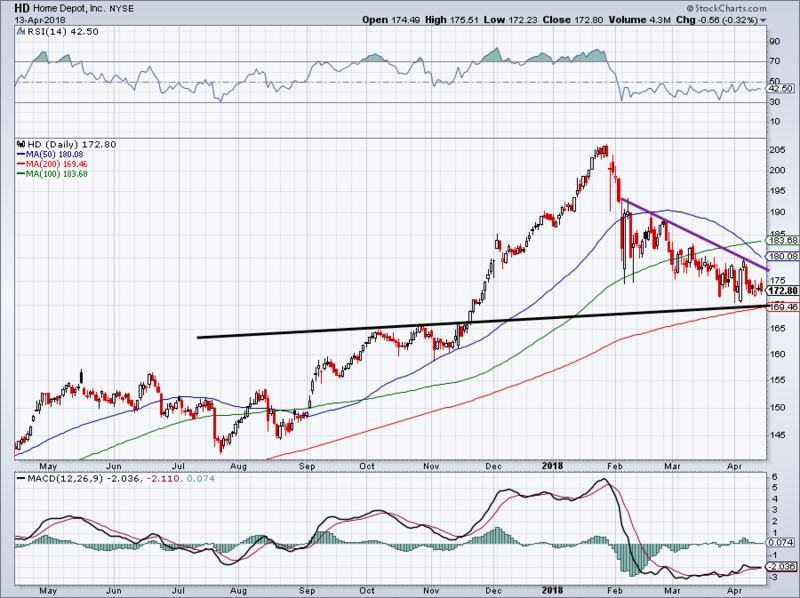 The broader market’s decline at the start of February has been a doozy for Home Depot Inc (NYSE:HD). After hitting a high near $207.50 in late-January, HD stock was pulverized down to $175 within just a few trading sessions. That 15.6% decline hardly seems fair, especially given that Home Depot stock still hasn’t recovered. In fact, shares are now below that $175 mark, recently closing at $172.80, down almost 17% from the highs. Let’s take a look at why the selloff is unfair and why HD stock is now a buy. Let’s be honest, retail hasn’t been a great investment over the last year. Amazon.com, Inc. (NASDAQ:AMZN) has risen to dominance behind a disruptive e-commerce wave. Many have been hurt but not crushed, like Macy’s Inc (NYSE:M) and Kohl’s Corporation (NYSE:KSS), while others are the ropes, like Sears Holdings Corp (NASDAQ:SHLD) and J C Penney Company Inc (NYSE:JCP). Surprisingly though, Home Depot has been a pillar of strength in the retail shakeup. Consumers can buy a DeWalt drill or a Black & Decker sander on Amazon, right? So how has Home Depot been able to hold up? The company relies on a rather “un-Amazon-able” business model. 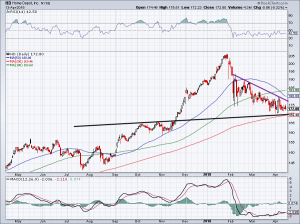 Meaning that, although Amazon can get into selling appliances or drills, most people still find comfort in heading to a Home Depot or a Lowe’s Companies, Inc. (NYSE:LOW). We’re not going to order lumber or mulch on Amazon and a contractor isn’t going to buy a box of nails or new pipes for plumbing online. Home Depot, particularly through its own ecommerce and omni-channel, is simply too convenient for contractors and shoppers for buying the types of goods that it retails. It shows in its operations, too. Home Depot has beat on earnings and revenue estimates for six straight quarters. Last quarter, comparable-store sales came in at 7.5% vs. expectations of 6.5%. It’s obvious that, like Costco Wholesale Corporation (NASDAQ:COST), Home Depot has a business model that isn’t necessarily invincible to Amazon, but does a heck of a job insulating against it. The spring shopping season brings shoppers into Home Depot for patio equipment, grills, mowers, warm-weather projects and gardening. While the next earnings report for Home Depot will be for its fiscal first quarter, its second quarter will capture the spring season. Did you know HD’s fiscal second quarter is its largest quarter of the year for revenue? On the analyst front, they expect 6.8% revenue growth in 2018 and 4% in 2019. For earnings, expectations call for robust growth of 26.5% this year and 8% growth next year. Management expects 6.5% comp-store sales growth in fiscal 2018. All of this is more impressive when considering that Home Depot plans to open just three new stores this year. Despite 26.5% growth, 6% revenue growth and 6.5% comp-store sales growth, we’re paying just 18.2 times 2018 sales estimates. That’s a great price! Additionally, Home Depot stock trades at just 16.8 times forward estimates. These forecasts are obviously more long-term than just the spring season, but the quarter is a big catalyst for HD’s business. Perhaps it will be what jars Home Depot stock out of its recent slump. Speaking of Home Depot stock, let’s see what the charts say. As you can see below, Home Depot stock has done a good job holding up in this $172 to $176 area over the past six weeks or so. Support around $170 seems strong and the 200-day moving average is also right there. There’s one issue though and that’s the downtrend line (in purple) weighing on HD stock price. If support is strong enough, it will push Home Depot stock through this resistance level. That should green-light a return to $180 and then eventually to its all-time hear near $207.50. A move back to this level would represent a rally of roughly 20% and while that seems big right now, it’s not as extreme as one might think. Consider that the average price target for HD stock price is $209. That’s actually above the all-time high! The bottom line: Home Depot is approaching its strongest quarter of the year, pays out a 2.4% dividend yield and has some of the best growth in retail. The valuation is reasonable and its growth is very solid. We’re buyers of HD stock. Bret Kenwell is the manager and author of Future Blue Chips and is on Twitter @BretKenwell. As of this writing, Bret Kenwell held a long position in HD. Article printed from InvestorPlace Media, https://investorplace.com/2018/04/home-depot-stock-surge/.